Some background is here. The opinion is here. The Supreme Court heard oral arguments today in the case involving lethal injection drugs. Conservative justices accused opponents of capital punishment of disingenuous delaying tactics regarding the drugs used in executions. Liberal justices suggested state officials were shading the facts to rush condemned men to the execution chamber. Records released in Arizona's botched 2 hour execution show inmate Joseph Wood was injected with 15 times the amount of lethal injection drugs called for by Arizona's death protocol. 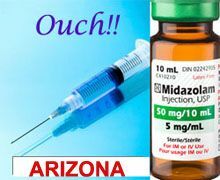 “The Arizona execution protocol explicitly states that a prisoner will be executed using 50 milligrams of hydromorphone and 50 milligrams of midazolam,” Dale A. Baich, one of the lawyers who represented Mr. Wood, said in a statement. 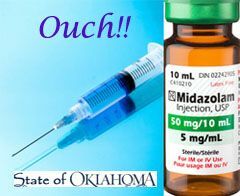 ...Mr. Wood was injected with 750 milligrams of hydromorphone and 750 milligrams of midazolam in all. Joseph Wood was executed in Arizona yesterday. It took two hours to kill him. 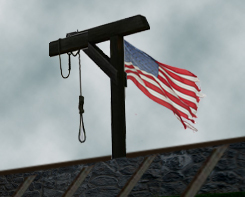 The execution was not halted, even though he repeatedly gasped and snorted during it. An Associated Press reporter who witnessed the execution saw Wood start gasping shortly after a sedative and a pain killer were injected into his veins. He gasped more than 600 times over the next hour and 40 minutes. Why didn't we give him Drano? The 9th Circuit Court of Appeals has stayed the execution of Arizona inmate Joseph Wood. The Court says he has a First Amendment right to know the details of the two-drug cocktail the state intends to use in killing him and the qualifications of the personnel who will administer them. The Georgia Supreme Court yesterday ruled its state law allowing anonymity for the makers of execution drugs, pharmacists and other personnel involved in executions is constitutional. A lower court had previously declared the law. unconstitutional. This case presents the question of whether it is unconstitutional for the State of Georgia to maintain the confidentiality of the names and other identifying information of the persons and entities involved in executions, including those who manufacture the drug or drugs to be used. We hold that it is not, and we reverse the ruling of the Superior Court of Fulton County in which it granted an interlocutory injunction prohibiting the execution of Warren Lee Hill with a drug from a confidential source in order to consider that question. Update: The full 8th Circuit reversed the panel decision and reinstated the execution. Supreme Court Justice Samuel Alito stepped up and issued a stay pending a further order by him or the Court. His stay order is here. Update: The 8th Circuit has stayed the execution. Via the Atlantic: Andrew Cohen writes that Russell Bucklew, scheduled for execution in Missouri tomorrow, is likely to be the next death penalty disaster for the U.S. That's because Bucklew has serious health issues. According to the testimony of Dr. Joel Zivot, a defense expert witness in the case, Bucklew "has a tumor growing in his face, occupying the nose, throat, and airway passages and causing him to experience constant facial pain and pressure as well as constant difficultly breathing." The congenital cavernous hemangioma, the doctor asserts, "results in a significant and dangerous compromise" of Bucklew's airways. Robert Patton, Director of Oklahoma's Department of Corrections, has written a letter (available here) to the Governor with a timeline of events in the botched execution of Robert Lockett earlier this week. Dennis McGuire struggled, repeatedly gasping loudly for air and making snorting and choking sounds, before succumbing to a new two-drug execution method today. Shorter version: You wouldn't do a dog this way. More here. 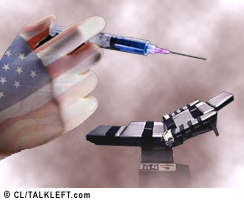 In 2007, Amnesty International released a report on botched U.S. executions. Ohio today executed Daniel Bedford with pentobarbital, a drug used to euthanize animals, that may or may not be effective in blocking pain. Bedford's attorneys say because of dementia and mental disability, he has no memory of the crime and may not understand he is being put to death. The decision by Hospira of Lake Forest., Ill., was prompted by demands from Italy, which does not have capital punishment, that no sodium thiopental - which the company had planned to make at its plant outside Milan - be used for executions, officials said. "We determined we could not prevent the drug from being diverted for use in capital punishment," said Dan Rosenberg, a Hospira spokesman. He noted that the company never condoned the drug's use for lethal injection and had hoped to continue making it for medical use. A few hours after the Supreme Court overruled a stay of execution for Jeffrey Landrigan, he was executed. When asked for any last words, he said in a strong voice with a heavy Oklahoma accent: "Well, I'd like to say thank you to my family for being here and all my friends, and Boomer Sooner," a reference to the University of Oklahoma Sooners. His last meal was well-done steak, fried okra, french fries, ice cream and a Dr Pepper. He spent 20 years on death row. According to records of the AZ Department of Corrections, Landrigan is a "Native Indian." Landrigan is the second execution in Arizona since 2000. Today there are 131 inmates on Arizona's death row, and 79 defendants charged with capital crimes awaiting trial. Another 10 are either on trial or awaiting sentencing for first degree murder. The Supreme Court tonight vacated the stay of execution an Arizona federal judge issued yesterday in the case of Jeffrey Landrigan. Landrigan was scheduled to be executed this morning using sodium thiopental that was manufactured by a company outside the U.S. which was not an FDA approved manufacturer of the drug. Arizona appealed to the 9th Circuit, did not prevail, and the matter was referred to the full court later today. Justices Kagan, Sotomayor, and Bryer would have denied the state's request and kept the stay in place. Arizona authorities are preparing the execution chamber now, so they can kill him within the 34 hour period set by the death warrant. Albert Brown will not be executed Thursday in California. The 9th Circuit Court of Appeals directed Judge Jeremy Fogel to re-examine his decision last week allowing it to go forward. The stay came a day after California officials announced that the state’s supply of sodium thiopental, a barbiturate used in executions, was good only until Friday, a revelation that seemed to shock the appellate panel. “It is incredible to think that the deliberative process might be driven by the expiration date of the execution drug,” the panel wrote. California's executions have been on hold since 2006. A federal judge today cleared the way for them to resume. He said the problem regarding the method of injection is solved by allowing the inmate to choose between a one drug or three drug cocktail. "Allowing a condemned inmate to make such a choice is consistent with Ninth Circuit authority in cases arising both in California and elsewhere," he wrote.